The Brandon Burlsworth Foundation, in partnership with Wal-Mart and Wal-Mart Optical, provides eye exams and glasses to pre-K through 12th grade students each year in Arkansas and the program will soon be in the SEC states of Alabama, Florida, Georgia, Kentucky, Louisiana, Mississippi, South Carolina and Tennessee. Within 5 years the program will be nation wide. 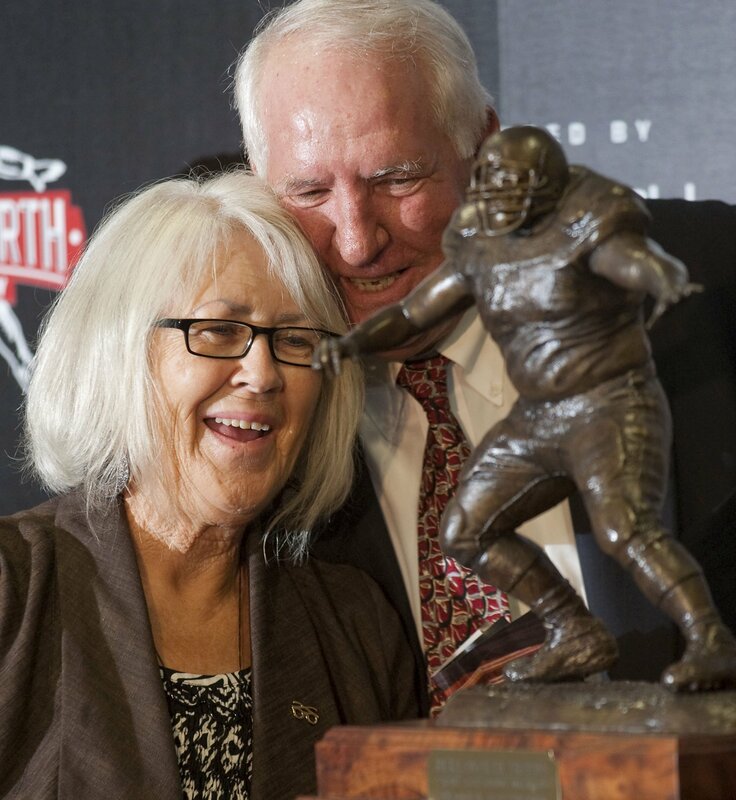 The Burlsworth Trophy is a national award given out to the most outstanding Division One college football player who began his career as a walk-on. The inaugural recipient of the Burlsworth Trophy was Sean Bedford from Georgia Tech. Brandon Burlsworth, 77, (top photo) and his Razorback teammates. 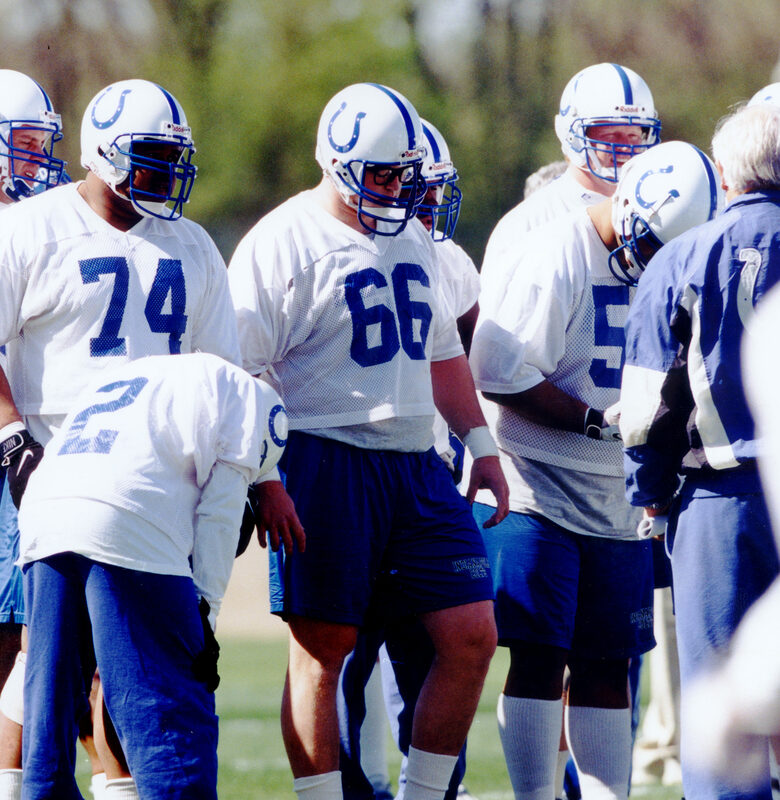 (Photo by Marty Burlsworth) In photo above, Brandon, 66, practices during his brief time with the Indianapolis Colts. 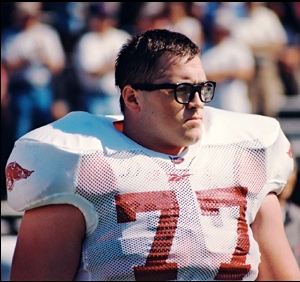 Anybody who knows Arkansas Razorback football knows the story of Brandon Burlsworth, how he turned down full rides at smaller schools to walk on with the Hogs, and then made his name as the best walk-on in the history of college football. Arkansas fans know that the Indianapolis Colts took him in the third round of the NFL draft in 1999, and that he died in a car crash weeks later. Most anybody who knew the story of Brandon’s life said it ought to be a movie.Brian Reindl was one of them, but he did more than talk. He made the movie,Greater, which opened the last weekend in August and is still playing in theaters. The project took more than a decade and cost millions of dollars. I’m glad he made the movie, because I wasn’t among the people who knew the story. 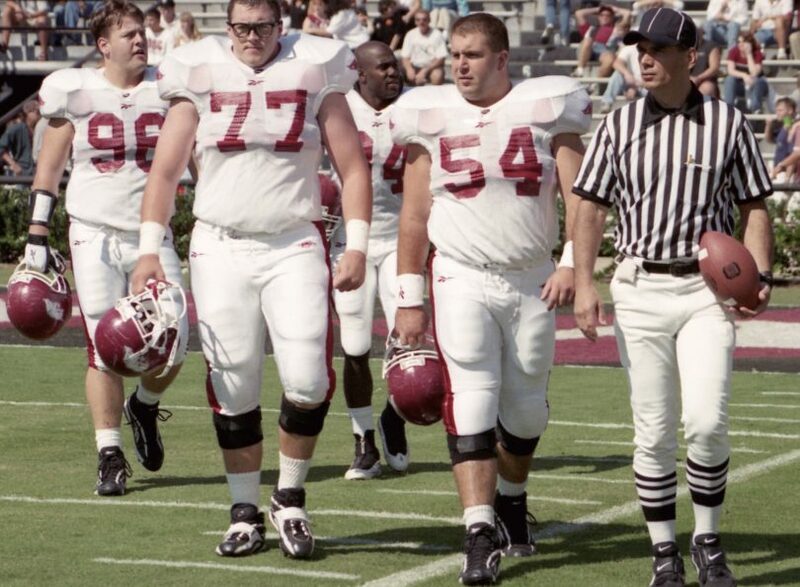 All I knew about Razorback football was that Marshall Cowley, a schoolmate from Pineville (Louisiana) High School went off to play for the Razorbacks looking like your normal high school offensive lineman. When I saw him after his first year under Frank Broyles, he looked like Arnold Schwarzenegger. After my wife and I saw the movie, I contacted Brandon’s family to learn some of the story behind the story. Marty, Brandon’s brother, and Vickie, his sister-in-law, were quick with responses, and generous with photographs. They are gratefully amazed that 17 years after Brandon’s death, his life continues to affect people for the good. Brian made the movie for about $9 million. Greater has earned back about $1.75 million and, as you would expect, has been popular in Arkansas. Greaterwas No. 1 in 25 of the 27 theaters in Arkansas over the opening weekend, Brian says. “Over the Labor Day weekend, we were the No. 1 movie in every theater we played in Arkansas.” The total box office take will be about $2 million, he says. 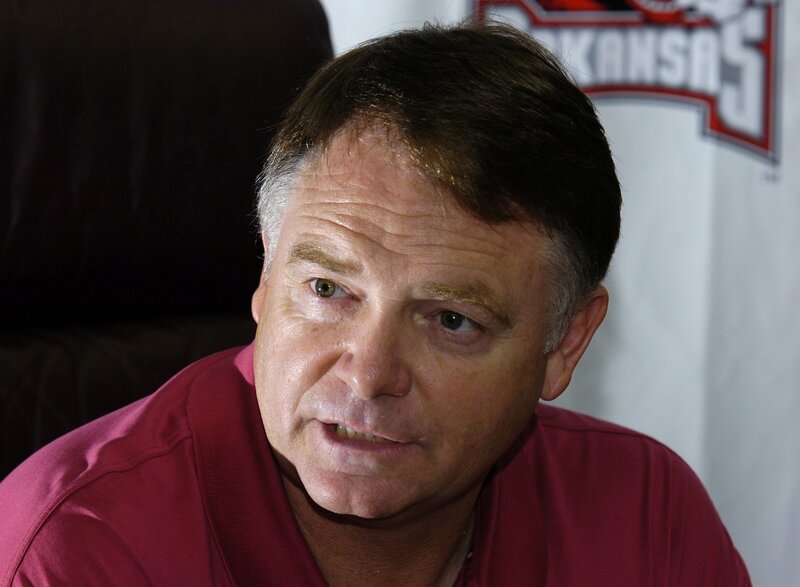 Houston Nutt likes the movie. (When I asked him what he thought of the actor they chose to play him, Coach Nutt’s opinion was a chuckle. “It’s Brandon’ story.”) Mr. Nutt’s first year at Arkansas was Brandon’s last. He hadn’t met Brandon until the team arrived in August for preseason training. Coach Nutt’s first real memory of Brandon is one of several anecdotes he shared with Mr. Reindl, who included it in his script. 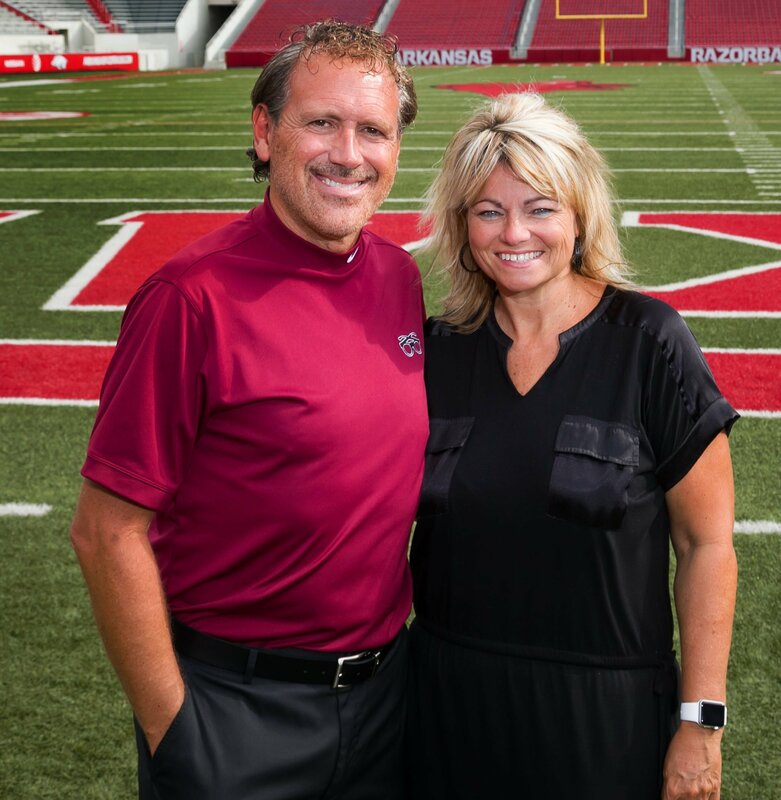 When Coach Nutt showed up to work, the Razorbacks were coming off two consecutive dismal seasons with 4 wins and 7 losses each. Coach Nutt had been pep-talking his players about the future, but not the immediate future. This was 1998. The coach was thinking ahead to 1999 and 2000, so in effect, he was peptalking the juniors, sophomores and freshmen. 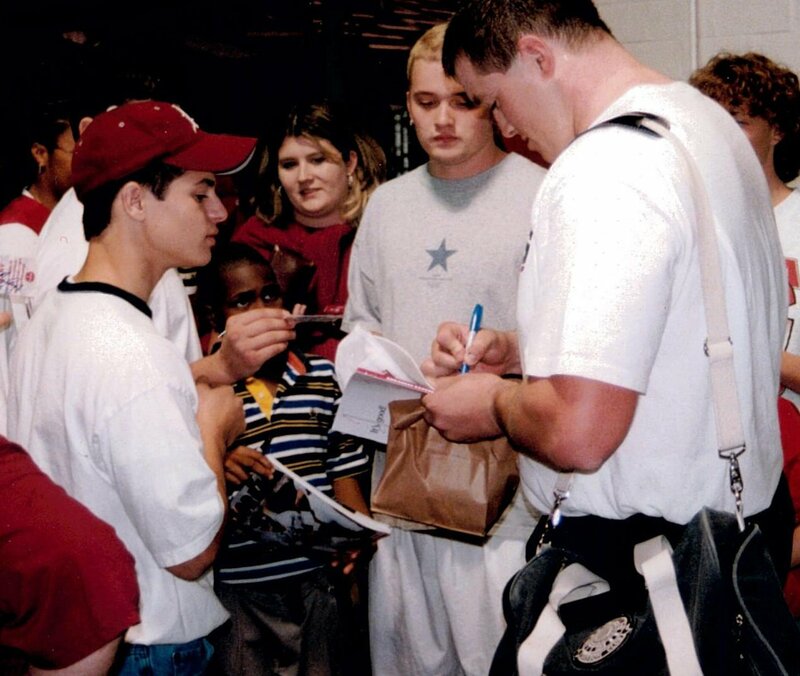 But Brandon, who also went on to become the first Razorback to earn a master’s degree before he played his last football game, urged his coach not to write off the seniors. They wanted to play on a winning team, too. In 1998. “He says, ‘I wish you wouldn’t use the word ‘rebuild’ ever. We’ll do anything. We’ve been through a lot,’” Coach Nutt recalled in a recent telephone interview from New York, where he was taping shows for CBS Sports as an analyst. “That sent a message to me that he wants to win. They had gone 4 and 7 and 4 and 7. He knew he only had three months left to play football in college. He was totally committed. Another memorable encounter, which also shows up in the movie, demonstrates Mr. Burlsworth’s characteristic work ethic as he prepared for the first game of the season – Alabama. “’Who is that?’” Mr. Nutt demanded. When Coach Nutt met him, Brandon knew he had only three months left in his college football career. He wanted it to count. 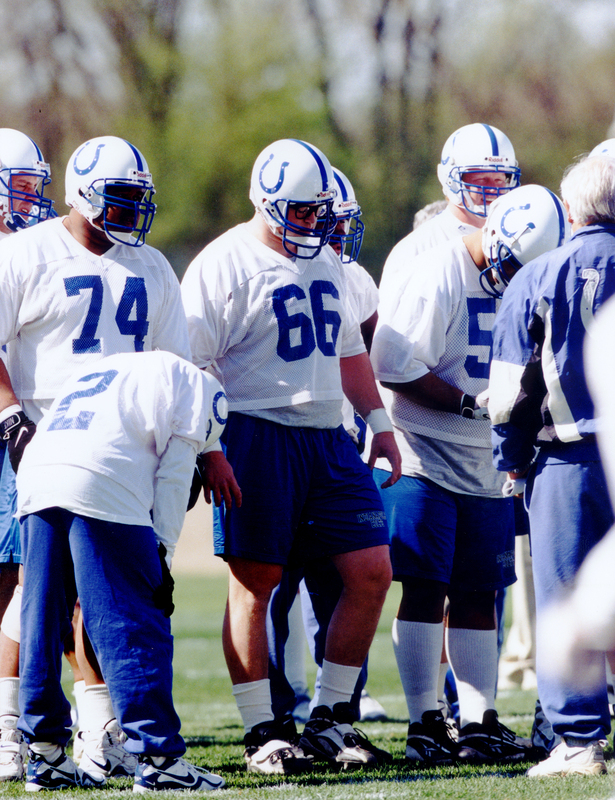 What he couldn’t know was that, except for a few days with the Indianapolis Colts in April 1999, those three months were all the football that was left to him. The Colts coaches were high on the Hog from Harrison. After Brandon’s camp with the Colts, a scout told Coach Nutt that Brandon probably would start as a rookie and likely would have a long career in the NFL. 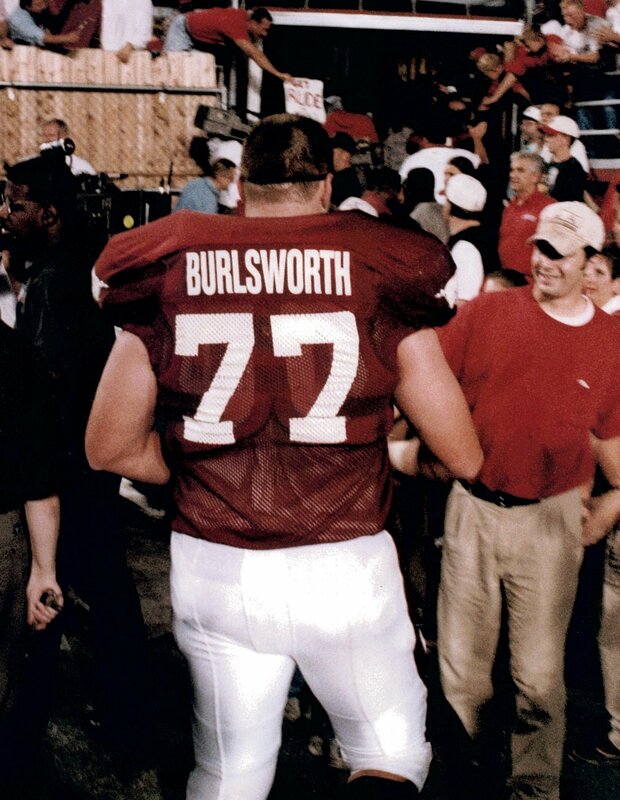 If he had lived and played, Mr. Burlsworth would have realized the dreams of every kid who dreams of the NFL. As an offensive lineman, Mr. Burlsworth would have protected one of the best quarterbacks ever, Peyton Manning, and he would have followed Mr. Manning to Super Bowl 2006 and a championship ring. After his two weeks in Indianapolis, Brandon flew home on April 18, 1999, a Sunday. His brother, Marty, and their mother, Barbara, met him at the airport in Springfield. On his short visit back to campus, Brandon told Coach Nutt that he wasn’t going to attend the ceremony to pass out rings on Wednesday. On Wednesday, Brandon ate lunch with Brent Bender, son of assistant Coach Mike Bender, who coached Brandon for four years. “Bran had called me at our photography studio that morning asking if Marty could help him find a new hub cap to replace one he’d lost on his car,” Vickie recalls. His parents, who had divorced, had bought a Subaru for Brandon to drive to college. On his way to Harrison to take his mother to church, Mr. Burlsworth’s Subaru crossed the center line and collided with an eighteen wheeler. Greater, the movie, includes several scenes from the November 14, 1998, game between No. 10 Arkansas and No. 1 Tennessee. The game is on YouTube. We have tagged some real-life moments to compare to the movie. In one scene, Brandon comes from out of nowhere to stop a Tennessee touchdown after the Volunteers blocked a field goal. In real life, Brandon’s chase is more amazing than the movie version. The sequence that leads to his fourth-quarter save starts at 2:05:40 – Tennessee sacks Clint Stoerner; Arkansas drops a pass that would have been a sure touchdown; Tennessee blocks a field goal, recovers the ball and the Volunteers’ Al Lewis runs like his feet are on fire for the endzone; but Brandon won’t let it happen. He outruns his teammates to knock the linebacker out of bounds at the Arkansas 36. At 2:13:05, there is a great shot of Brandon, unmistakable in his black-frame glasses. With the Hogs ahead 24-20, the Hogs blow a punt and give Tennessee two points with a safety, then kick off. Tennessee stalls, and with a minute, 54 seconds left on fourth and 9, the Volunteers fail to convert, and the Hogs take over on downs. On second down and 11, Brandon and Stoerner’s feet tangle, Stoerner trips, falls and fumbles. In the replay, you can see Brandon and Stoerner cross shins. Watch it at 2:26:00. In the movie, Brandon tries to convince Stoerner to blame him for the turnover, but Stoerner takes responsibility. With 30 seconds left, Tennesse scores a touchdown, goes ahead for the first time in the game, and wins 28-24. 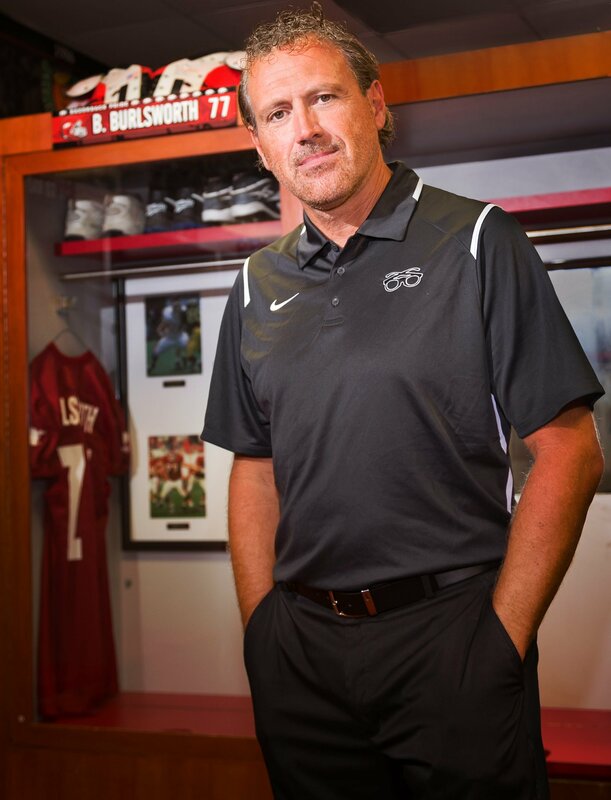 Host Loren Tepper talks with Marty Burlsworth, Executive Director of the Brandon Burlsworth Foundation, about the Football Camp coming to FS Garrison Stadium in Harrison on June 10th and 11th. For information and to register go to http://www.brandonburlsworth.org. Quinton Aaron, star of “The Blindside”, discusses why he is so proud to be a part of “Greater”, and talks about the faith and character of Brandon Burlsworth, the greatest walk-on in college football history. “Greater” is Brandon’s story. 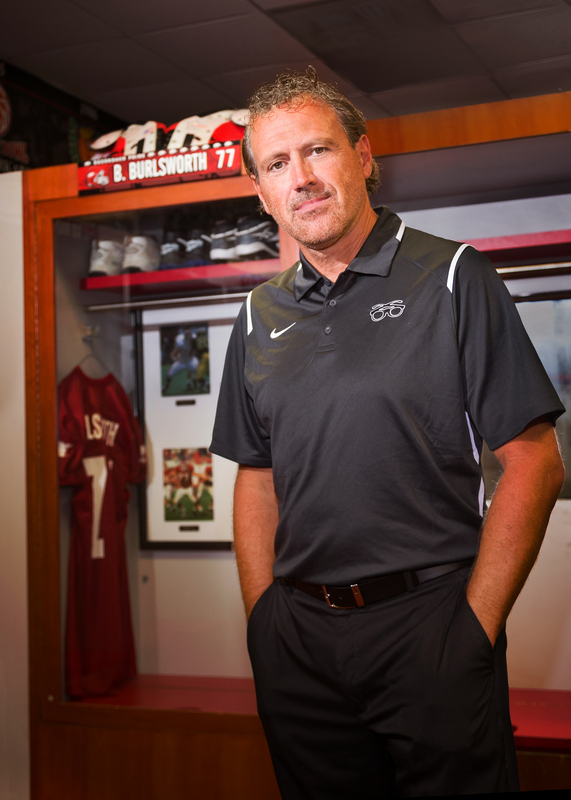 The Brandon Burlsworth Award will honor the former hog’s memory and help walk on hogs succeed. Brandon was a walk on turned All American at the University of Arkansas. He was drafted by the Indianapolis Colts and 11 days later was tragically killed in a car accident. 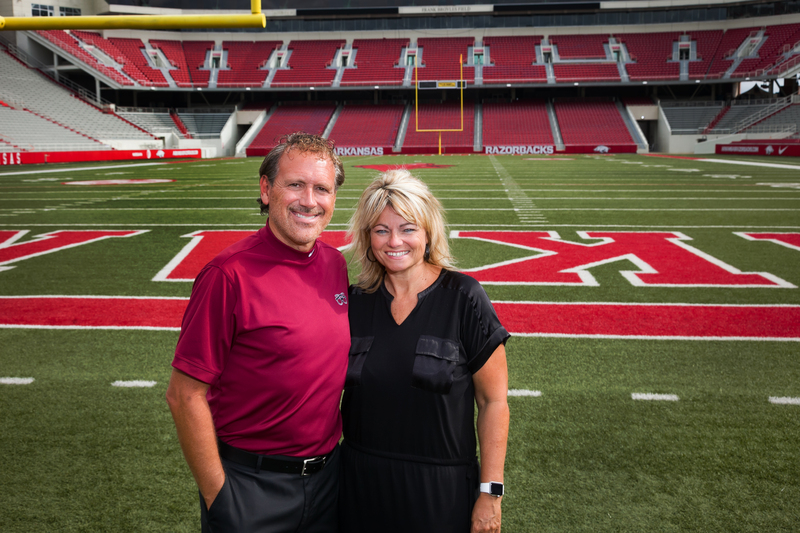 The Brandon Burlsworth Foundation was founded in his name and has several programs: The Burls Kids program takes underprivileged children to all Arkansas Razorback and Indianapolis Colts home games. The BBF in partnership with Walmart provides eye care to 14,000 pre-K thru 12th grade students whose working families are trying, but still cannot afford extras like eye care and do not qualify for state funded programs. We hold football camps each year in Harrison and Little Rock and we have several football scholarship and awards including the Burlsworth Trophy, a national award given out to the most outstanding Division One college football player who began his career as a walk-on. Death toll to 125 in Joplin, How can a good God allow evil and suffering?